This is one of those project ideas I’ve had swimming around in my head for a few days and just had to find the time to sit and create it! 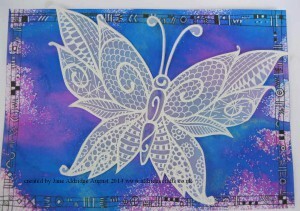 I started by stamping and embossing with white powder onto vellum with the Woodware Curly Butterfly stamp. I next zentangled patterns using my white gel pen, and I tried to get them as symmetrical as possible. I trimmed out my butterfly close to the edge of my embossing. This gives a lovely lacy effect with the zentangle patterns over the vellum. 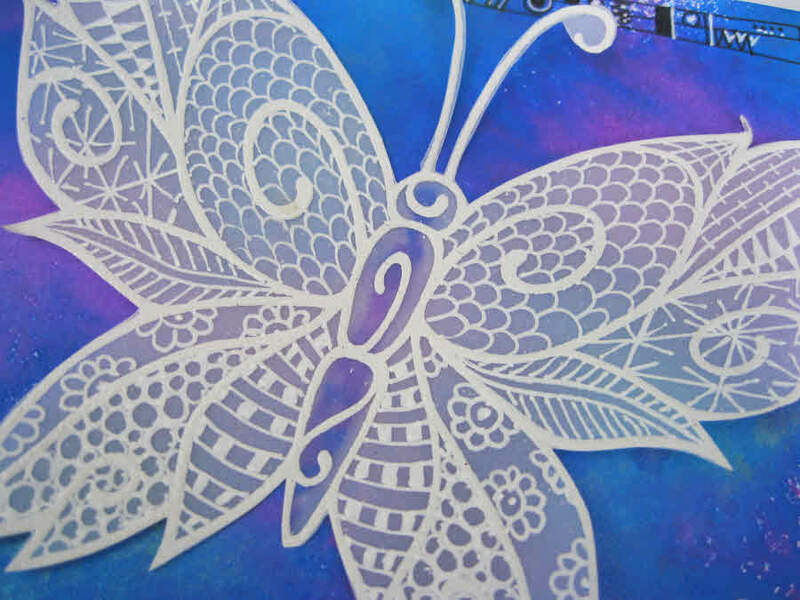 I needed a bright background to make the most of the butterfly and I found this one in my stash which was sprayed with bright colours of Cosmic Shimmer Ink Misters. I added a random zentangled border around all sides to tie in with the butterfly. i was really pleased with the end result – the butterfly looks so pretty!